Sundays are some of the best and most relaxing days at camp. We all loved sleeping in for an extra hour and were greeted in the dining hall by donuts and delicious cereal–it’s the little things that make Sundays special. The rest of the day was a little different from the norm, too. 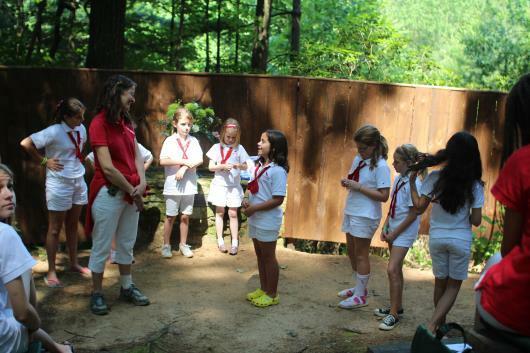 We had some time to clean cabins and get into uniforms before going to chapel. 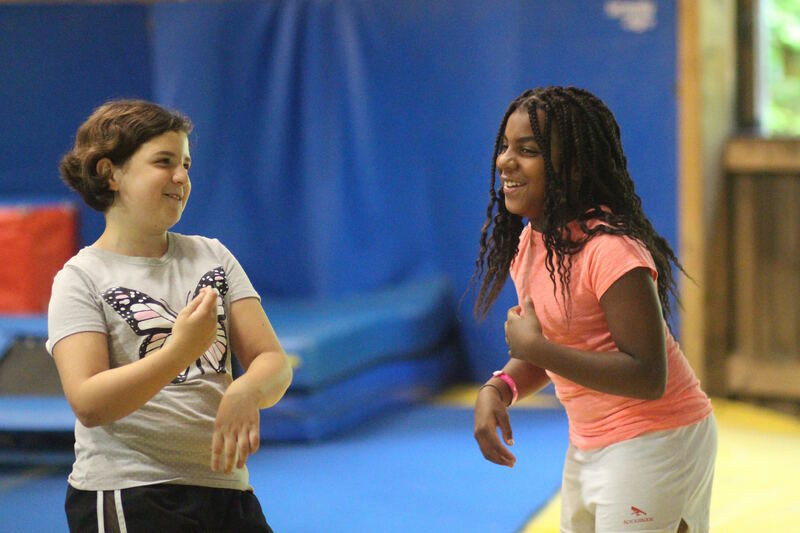 The theme was friendship, and girls spoke about how camp has given them some of their best friends. One middler spoke about how, when she left a necklace she had made at the shaving cream fight, one of her camp friends walked back down with her to help her find it. Being together all the time allows girls to rely on each other in ways that seem small, but actually help them to form incredibly close bonds. Chapel left us all feeling uplifted, reflecting on these close and beautiful relationships as the last week of camp starts. Then, we had assembly on the hill. This brought our energy way up, as we learned new songs, announced spirit and manners awards, and had mop awards presented by the Door Fairy, Midget Man, and Mermaid from the Mermaid Club. Part of the fun of camp, which was particularly present today, is the lexicon and jokes everyone here shares. The door fairy, for example, is said to live in every door, and she hates when campers slam the screen doors! If campers slam the door, you’ll frequently hear them apologizing to the door fairy, who is very forgiving. After a delicious lunch of macaroni and cheese and grapes, we had one of the most highly anticipated all-camp events: Miss RBC! This is a spoof on a beauty pageant, in which all cabins choose a “representative” and then they all plan a talent together. This year, girls had to think quickly to come up with their talents. 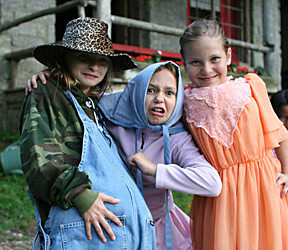 Many groups performed skits or sang songs. Many of them were jokes that cabins had amongst each other and line (one camp enchored a skit they did for their line about “bun fun,” or a song about how much they love different kinds of buns (hot dog, cinnamon, etc.). Others employed camp-wide jokes (about how Bill Nye the Science Guy is our camp director, Jeff’s, celebrity doppelganger, for example) that were fun to share with everyone. It was a high-energy, high-humor event that kept everyone laughing for a couple of hours. Then, the representatives took turns answering fun questions like, “If you could have one extra hour of camp every day, how would you spend it?” (Eating muffins–a great answer!). It was a day that kept everyone laughing and relaxing after a couple of great and busy weeks at camp! 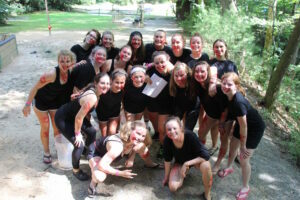 The winning cabin was Senior 7, and the following was their incredible rap that earned them the title of Miss RBC. Soon RBC was open–There was even a camp store! Gotta do our chores–you know! Sometimes at camp, I ask my girls what their schedule is like at home. Their answers amaze me: their days are jam packed with school, sports, and other activities. 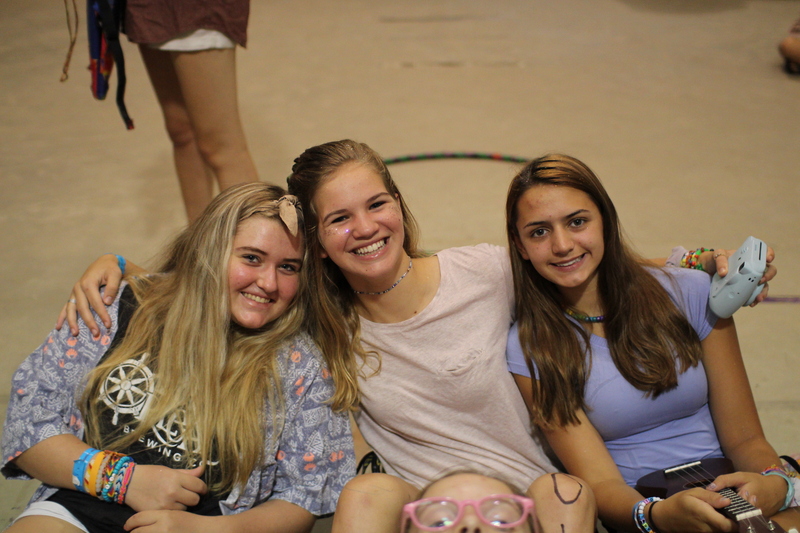 My campers are in high school and, as high achievers, I am really impressed that they are able to balance everything and still have time for friends and fun. Still, there is a lot on their plate: between basketball, dance, really challenging classes, and other pressures, many say they get stressed. They view Rockbrook as a break from that, and Rockbrook is uniquely suited to providing a less stressful environment. At camp, I think we take a step back and look at what really matters, and have patience with the rest. 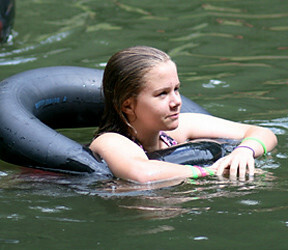 It’s a place where a camper doesn’t have to worry about being reprimanded if she is five minutes late to an activity. Instead, she is greeted with a smiling face and excitement. It’s a place where we wear costumes and do crazy dance moves without fear of being judged. It’s a place where ‘perfect’ doesn’t really matter, but being a good friend does. 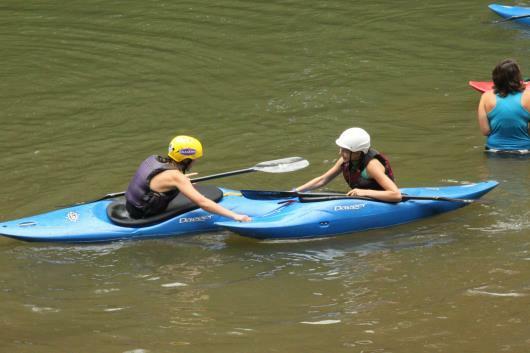 Without the stresses of our outside lives and with a really loving and supportive community, girls feel profoundly comfortable to try new things and get close with people. Sundays at Rockbrook really exemplify this. We take things a little slower on Sundays. After the girls’ dance last night, everyone was exhausted, so the extra hour of sleep was greeted with joy. We then ate Krispie Kreme donuts for breakfast (a camp tradition!) before going to chapel. The juniors and middlers led chapel this morning, and we all reflected on the theme of “Playfulness.” We sang songs like ‘Zip a Dee Do Dah’ and girls shared their thoughts on playfulness and how they think about it at camp. It was a perfect way to spend the morning before a delicious muffin break and tidying up our cabins. After that, we had Assembly on the Hill. This is a time for the entire camp to come together and honor cabins with the famous ‘Mop Award,’ or a prize for the cleanest cabin. We also honored girls who were outstanding in the categories of Spirit, Manners, and Bend-a-Back, which means going the extra mile for a friend. After, we watched as the counselors had an old-fashioned water balloon toss. The middlers won! We have a good amount of down time on Sundays, and everyone appreciates the chance to have a break and hang out for a little bit of time. Bop It has been big in my cabin this session, along with Trivial Pursuit and playing drums. 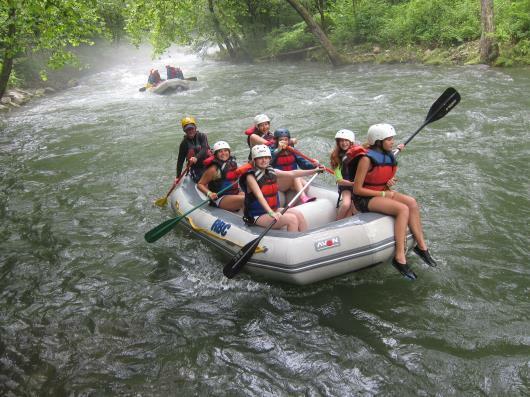 During a stretch of time today, my cabin of fifteen-year-old girls spent time playing together in the creek. Every cabin has something that brings their cabin together, and it is nice to have a little bit of ease in the schedule so we have time to hang out with no rush of going somewhere else. This afternoon, we had an extra long rest hour (such an important part of the day!) and then it was time for Miss RBC. 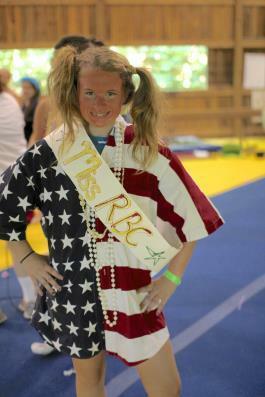 Miss RBC is basically a talent show where each cabin puts on a skit for the rest of camp. 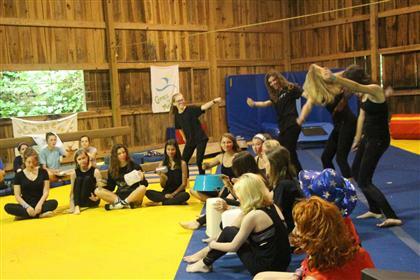 Girls get very creative—the CA’s played drums and interpretively danced/sang to Eye of the Tiger. Senior 4 rewrote the lyrics to ‘Hush Little Baby,’ singing, “You’re going to follow the cardinal bird.” Middler 4 ended up winning—they did a time traveling skit that went through the decades starting in the twenties. They sang songs and did dances from each decade—it was incredibly impressive! Everyone in the audience was wide-eyed and clapped wildly after the performance! For Miss RBC, we don’t use outside music or flashy lights. We just need the stage of the gym and a lot of imagination. I think there is something beautiful in the way we are completely captivated and entertained even without all of the distractions we usually would have at home. It is such a simple event to put on, but everyone enjoys performing and celebrating others’ talents. 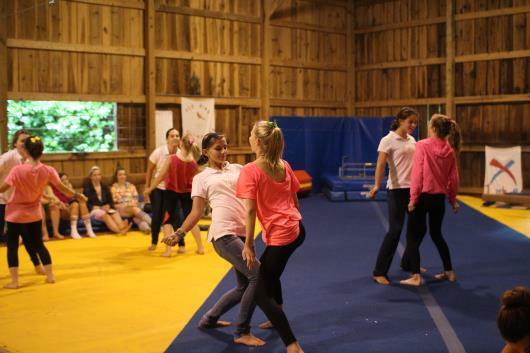 After dinner, we had a barn party as the twilight activity! 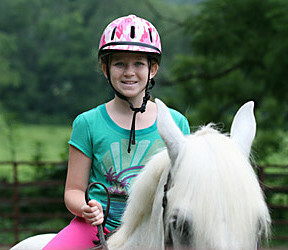 Girls could choose to walk down to the barn, play with the horses, eat a Popsicle, and watch the drill team perform! The drill team is comprised of girls who love riding, and they were able to synchronize their moves—it was quite a performance! Afterwards, the drill team members got Dolly’s, an extra special treat! After a wonderful day of relaxation, it was time for movie night! Girls look forward to this every Sunday night. They bring down sleeping bags and pillows and curl up next to their good friends and watch great movies. Tonight, it was Zootopia! Every age group loves this movie, and many had not seen it before! Tomorrow, we will return to a normal schedule, which is great because we get to continue doing so many activities! Still, today was a needed day of relaxation. Camp is winding down. Next Thursday, we will be back in our normal lives, back with all of the worries, joy, and support that come with that. What we have learned at camp, though, does not need to stay at camp. Rockbrook teaches us to slow down and reconsider what is important and what is not. We stop worrying about how we are perceived, and we realize that perfection is not the expectation. The biggest lesson I hope we take with us when we leave these mountains is simply: I Am Enough. Ever since Harry Potter Day, I have been thinking a lot about personality. In the context of Harry Potter, it comes down to which house would I be in? The brave and chivalrous Gryffindor? The friendly and loyal Hufflepuff? The intellectual, witty Ravenclaw? The ambitious, cunning Slytherin? Of course, personality is not so neatly cut between these categories (and that is never how it was originally intended in the series). Still, the diversity of personalities at camp is possibly its greatest treasure. 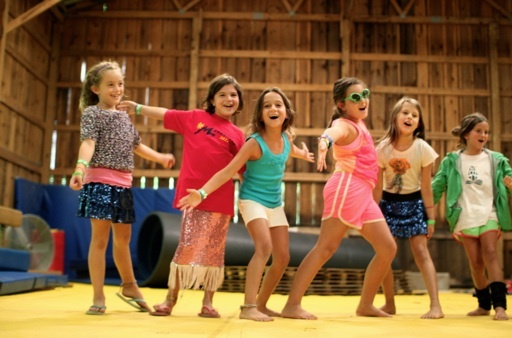 Rockbrook, in particular, is a place where girls from many personalities can fit right in and feel at home. Girls are free to be honest and bold, or shy and peaceful; there are times when outgoing and loud girls let their personalities shine, but also times for quiet contemplation. Today’s agenda displayed how Rockbrook is able to play to all kinds of interests and personalities, and how everyone can find a part of the day that fulfills their needs. Everyone was looking forward to today, a day that allowed us to sleep in and get some needed rest as we prepared for our final week at camp. We awoke at nine and then went to breakfast in our pajamas. Krispie Kreme donuts were placed on our tables, a favorite Sunday tradition, and then we went back to cabins to get in whities and get ready for chapel. We stood in a horseshoe shape and raised the flag before quietly reflecting on the walk to chapel. Chapel is one of my favorite spaces and times at camp. 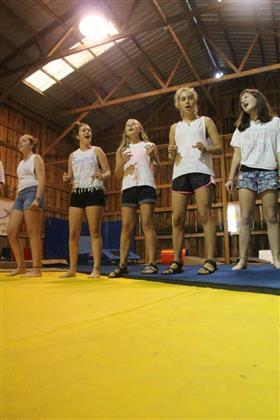 So often, camp is loud: singing in the dining hall, cheering on friends on the hill. 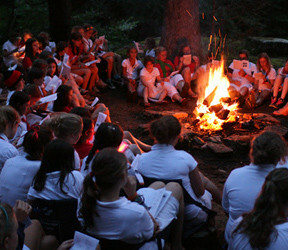 During chapel, though, we find a peaceful place to reflect on an important theme of camp. Today’s theme was bliss, or the light continuous feeling of happiness. The senior line led chapel this morning, so two girls played guitar as girls filed in. 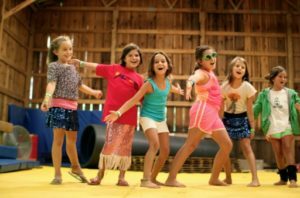 Then, they led song such as ‘Let’s Go Fly a Kite’ (complete with kites as props), ‘Unwritten,’ and ‘Wildflowers.’ The girls spoke about what bliss meant to them and how it related to life at camp. After chapel, we cleaned cabins and tried to get our belongings organized. Sunday provides a perfect opportunity to reset for the week ahead. Then, we gathered on the hill for another Sunday tradition, Assembly on the Hill. This is a time that is loud where girls and cabins get recognized for their efforts throughout the week. All of the lines sing their line song loudly and then line heads present cabins and individuals with awards. The Mop Award is for the cabin that has the most points from inspection, and the Spirit Award, Manners Award, and Bend-a-Back Award go to individual campers who have been examples of spirit, etiquette, and going above and beyond for others. 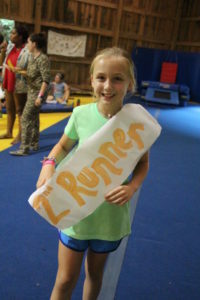 It is a challenging decision because there are so many reasons every camper could earn each award! Then, all of the mermaids and bull’s-eye club members were honored. Assembly on the Hill is a great time to show your cabin pride and so many girls cheered loudly for their friends as they were honored! For twilight tonight, we had a very special event: a string trio and quartet from the Brevard Music Center came to Rockbrook and gave us a performance as we ate dessert! One of the musicians talked about the different periods in musical history (baroque, classical, and romantic), and they played examples of each. Girls had the opportunity to ask about the instruments and the experiences of each musician. Sitting there listening to beautiful music after an action-packed and energy-filled day could not have been a better end to the day. Many girls loved the opportunity to listen to fine music and get lost in their own thoughts as inspired by what was being played. It was a calmer, more contemplative (yet still interactive) way to spend the evening, and it made me appreciate how everyone could take something beautiful away from this day. We lived a lovely day today. 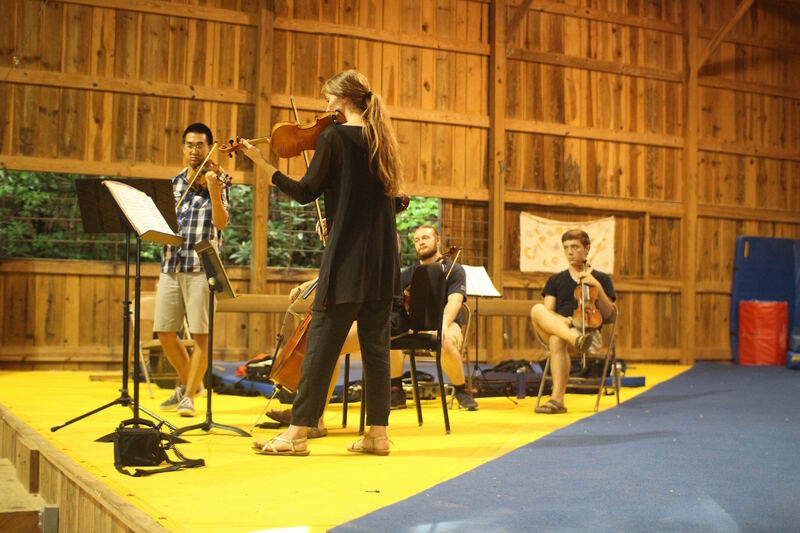 Chapel and the string ensemble gave us time to be contemplative and reflect on all of the action we have lived. 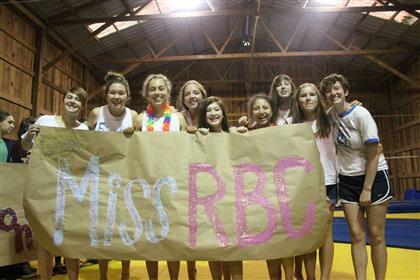 Miss RBC and Assembly on the Hill gave us times to be loud and enthusiastic, basking in the spirit of camp. In the coming, final days, we will find other activities that meet our needs. Activities like curosty, needlecraft, and yoga give us a calm space to center ourselves whereas sports and games, swimming, and climbing give us more opportunities to live out loud. At Rockbrook, some girls like to have conversations in small groups whereas others love big groups and being the life of the party. Some girls love crowds and spirit, and others love the calm peace of nature. 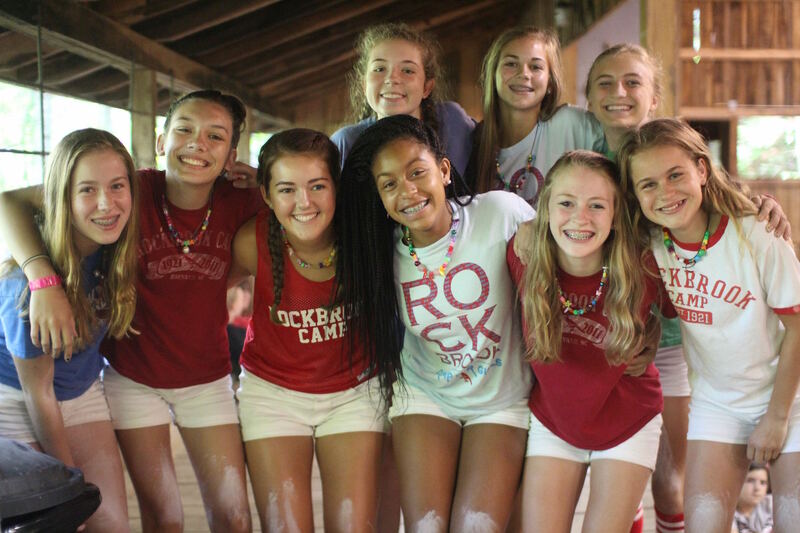 Most girls love both, which is great, because Rockbrook is able to provide an atmosphere that suits every type of girl and that celebrates every type of personality. RBC started off our lazy Sunday with a full extra hour of sleep and a special treat of Krispy Kreme donuts for breakfast. 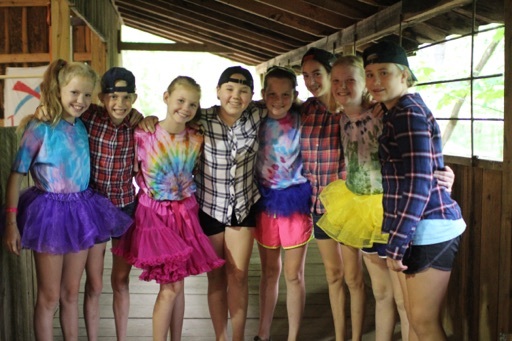 The girls came to the dining hall in their pajamas, and then returned to their lines after breakfast to tidy up both their cabins and themselves in preparation for Cabin Inspection and Chapel. Chapel at Rockbrook is always a meaningful experience full of sharing communal values in a supportive, safe place. 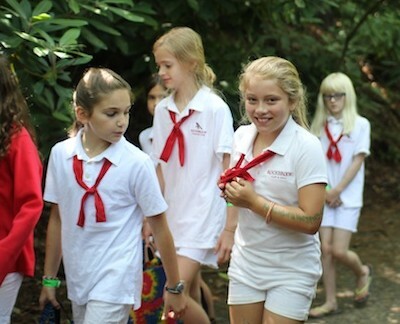 Today’s theme, goodwill, promoted feelings of kindness and awareness towards others, in addition to being the namesake of one of our oldest buildings on the property—the home to our camp library and the activity K.I.T. (Keep In Touch). 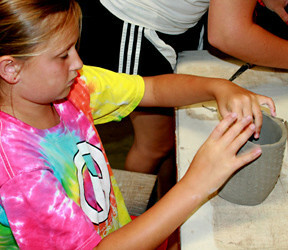 Girls from every age group volunteered to share stories and sentimental objects that they believed symbolized goodwill. Many of the stories focused on the idea that a small act of kindness towards someone else can start a domino effect of good deeds. No matter how small an act of goodwilll is, its impact can be monumental. One counselor shared a story she remembered from a TED Talk, an organization devoted to the spread of ideas in Technology, Entertainment and Design. The video of the talk is below, filmed September 2010 at TEDxToronto. I highly encourage you to watch the short video for the full story. However, I have also included the meat of the transcript below that I felt connected well to our chapel theme. This is the story of lollipop moments. Here’s the kicker: I don’t remember that. I have no recollection of that moment. I’ve searched my memory banks, because that is funny and I should remember doing it and I don’t. That was such an eye-opening, transformative moment for me, to think that maybe the biggest impact I’d ever had on anyone’s life, a moment that had a woman walk up to a stranger four years later and say, “You’ve been an important person in my life,” was a moment that I didn’t even remember. How many of you guys have a lollipop moment, a moment where someone said or did something that you feel fundamentally made your life better? All right. How many of you have told that person they did it? See, why not? We celebrate birthdays, where all you have to do is not die for 365 days. Yet we let people who have made our lives better walk around without knowing it. Every single one of you has been the catalyst for a lollipop moment. You’ve made someone’s life better by something you said or did. If you think you haven’t, think of all the hands that didn’t go up when I asked. You’re just one of the people who hasn’t been told. 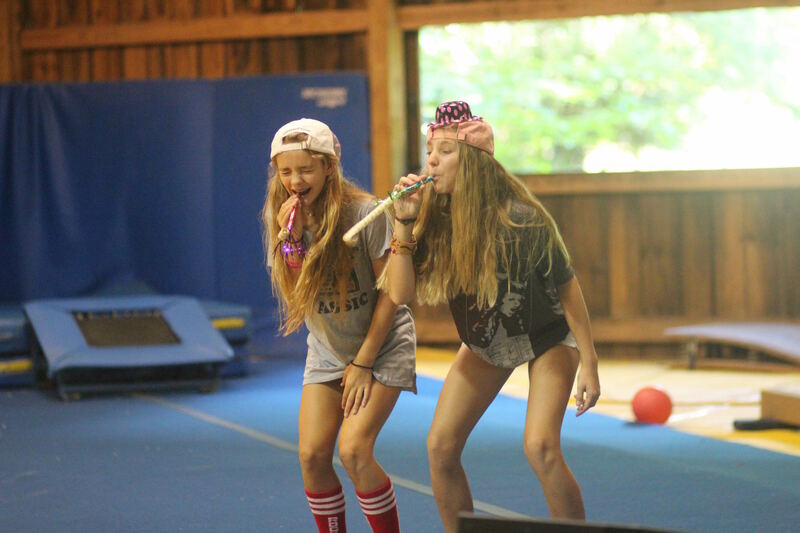 Rockbrook is full of lollipop moments shared among campers and counselors alike. So many of our values at RBC encourage us to share and support and grow alongside each other while at camp. 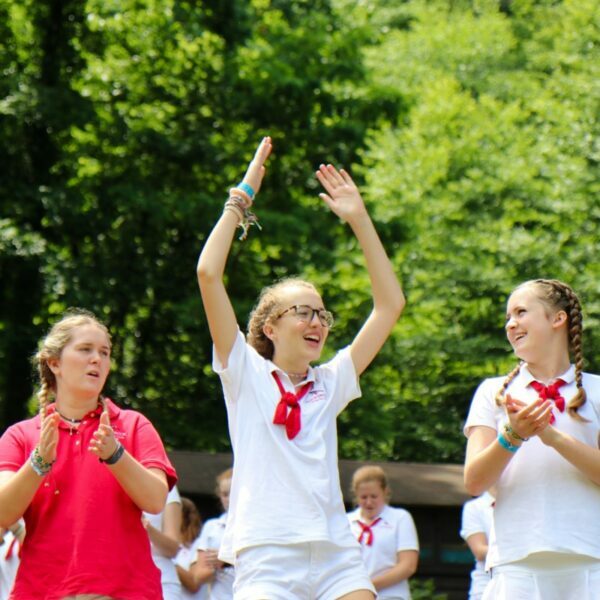 I truly believe every Rockbrook girl has a lollipop moment in mind when she immediately begs to sign up for next summer as she waves goodbye to this year’s cabinmates and counselors. And I also truly believe that we have all inspired those moments in others, whether we are aware of our impact or not. 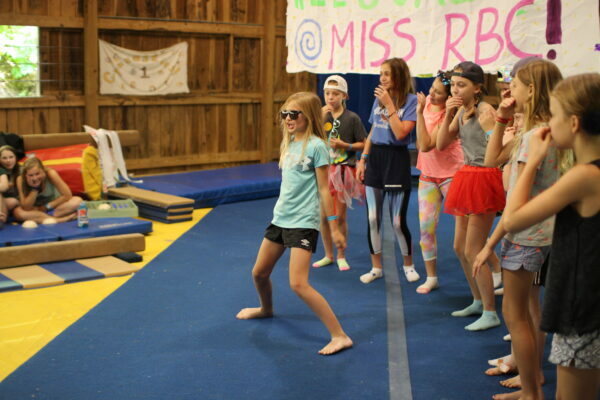 It was very fitting that our afternoon culminated in another Rockbrook special event, Miss RBC, which asks each cabin to collaborate on a skit of some sort. 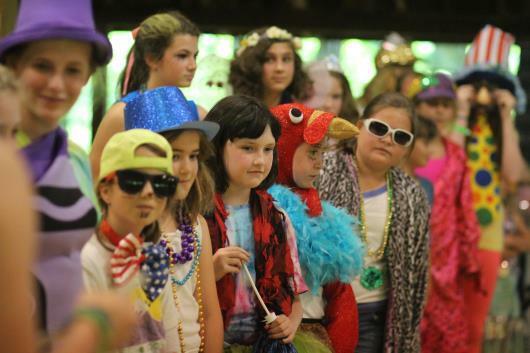 Remixes of traditional Rockbrook songs, rewrites of chart-topping hits, and some groovy dance moves were only a few of the highlights of the skits. Other girls chose to make their own music with their hands and feet and voices, or with props, including pots and pans. 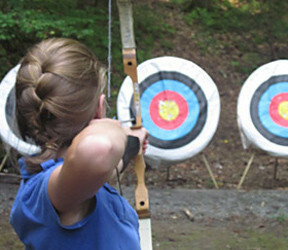 This event always challenges the girls in some way or another. It requires teamwork, communication, and compromise. 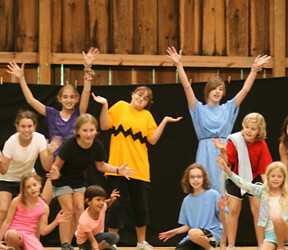 But in the end, every skit comes together to form something beautiful that includes each and every camper in some way. It’s a celebration of taking a chance, of getting up on stage in crazy costumes to perform in front of a lot of other people, knowing the whole time that you’re not alone, that the girls on either side of you are also wearing a similar goofy costume and singing their hearts out about muffin breaks in harmony with you. The entire point of Miss RBC is to be confident while looking and acting silly, together. That’s pretty much the goal of camp in general, too. Having the confidence to laugh at yourself for wearing three pairs of sunglasses and a pink boa inspires others around you to be confident and goofy. It lets our true and authentic selves shine through. I can think of no better place than Rockbrook where we can explicitly recognize these lollipop moments, and also intentionally create them. We pay it forward at camp; and in return we receive encouragement, love, and friendship. My parting words this evening, then, are as follows: Peace on earth, goodwill to men, and pink boas for all. Sunday at Rockbrook offers a change of pace. 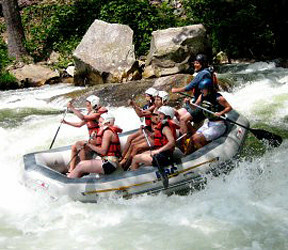 It is a much more relaxed schedule that allows both time to recuperate and to reflect. Everyone got to sleep in an extra hour this morning and come to the dinning hall in their pajamas where we were all treated to donuts at breakfast. 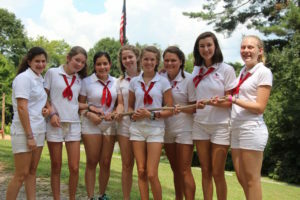 After our leisurely breakfast, all the girls and staff had plenty of time to return to their cabins and change into the traditional Rockbrook Sunday uniform of white shorts, white collared shirt, and the red sash tied in a square “friendship knot.” When the bell rang, the whole camp lined up around the flag pole to watch the color guard raise the flag. The privileged honor to perform as the color guard is one of the many responsibilities reserved for the the oldest group of campers called the “Hi Ups.” After the flag raising, and the pledge of allegiance, the campers and staff walked in silence down the lower line to Rockbrook’s open air chapel in the woods where they sat on rustic log benches. 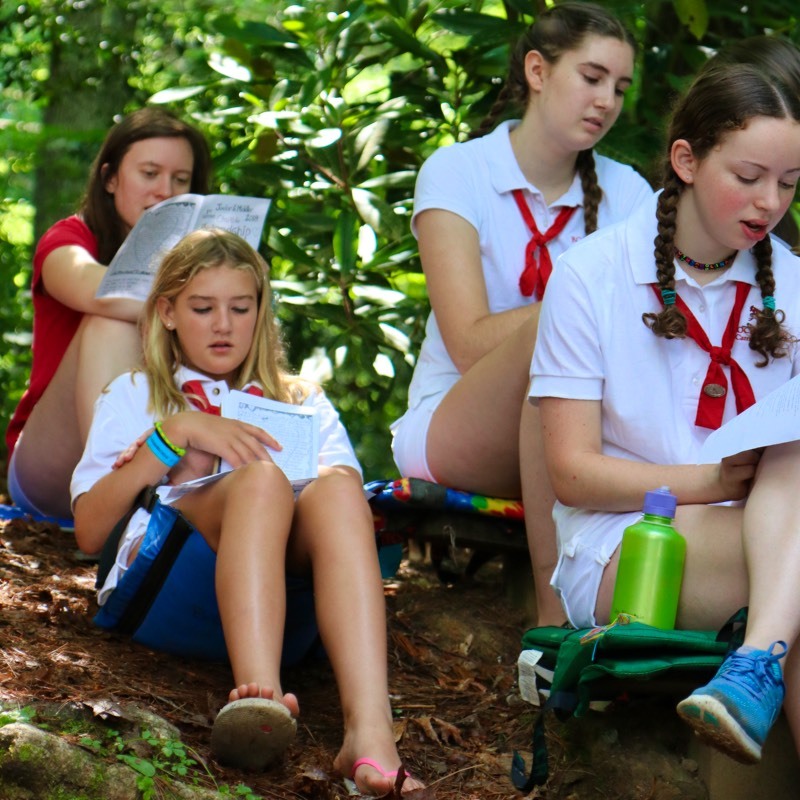 This week’s chapel was led by the Middler and Junior lines on the theme of “friendship.” Campers and counselors from these lines prepared and presented readings, personal stories, and songs centered on the topic of friendship. Sarah Carter read a book, “Our Friendship Rules” and led a brief discussion about the story before opening the floor to any campers who wished to add their own thoughts or experiences about friendship. 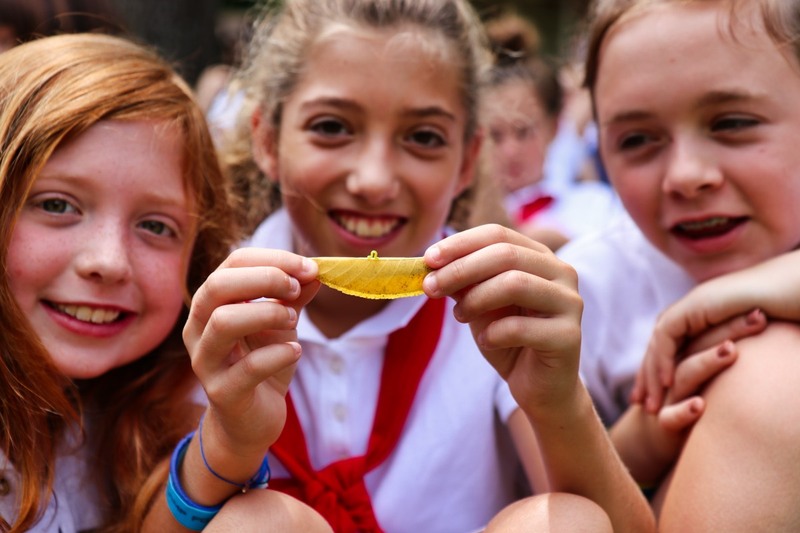 Chapel at Rockbrook is always a positive welcoming environment where campers are given the chance to observe, express, discuss, and reflect on some of the many experiences they are learning about here at camp. Then this afternoon, they changed out of their uniforms to dress up and show off their talents at the much anticipated Miss RBC pageant. 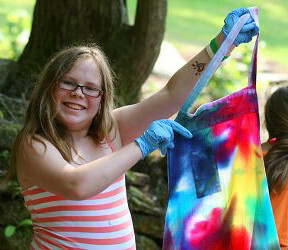 The campers were given a few days notice to prepare a performance of their own invention. 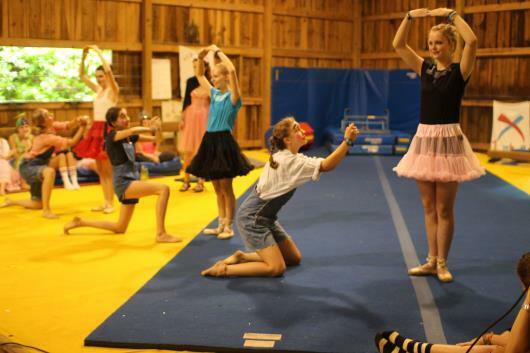 Cabins worked together as groups to come up with dances, skits, and songs to perform for the rest of the camp with everyone from the cabin participating. Today we saw lots of impressive gymnastics, circus tricks, dancing, singing, and fun. Many of the silly costumes campers brought from home came out of their trunks today to make an appearance and add to the fun, colorful atmosphere of the pageant. “Non-competitive” is a word that gets a lot of use here at camp. 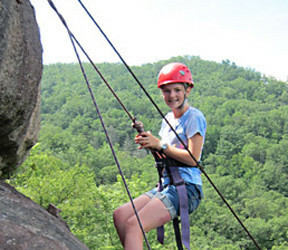 It serves as a reminder to campers and staff alike to pursue camp activities for the joy of it—for the thrill of acquiring new skills, and embarking on new adventures—not for the sake of victory. 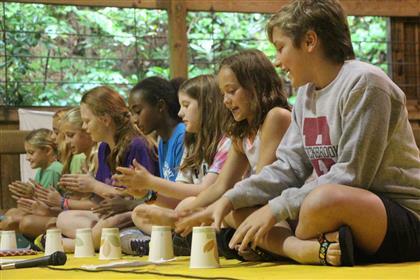 We do our best to bring this non-competitive flavor to every facet of camp life. Every cabin gets their own unique “award” for their skits during Evening Program (“Best Break-Dancing Statue of Liberty,” and “Best Impression of a Watermelon” were some recent favorites of mine), every cabin gets a prize at the end of Counselor Hunt, and every girl even gets their own birthday cake on Birthday Night, so the fall-, winter-, and spring-babies aren’t left out. It isn’t that we think competition is bad. On the contrary, competition can be exciting, enriching, and even wholesome in the right setting. What we do try to promote at camp, though, that might be different from the messages of schools and sports teams, is replacing the drive to win with the drive to accomplish. 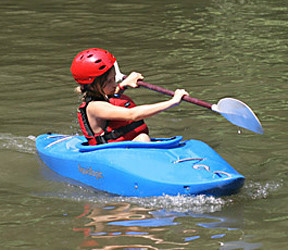 We encourage our campers to accomplish as much as possible in their time at camp. We offer reams of friendship-bracelet designs of increasing complexity for them to try their hands at. We coax tentative swimmers into swimming class, so they can work on their strokes with the lifeguards. We stand patiently at the bottom of the Alpine Tower, to talk nervous climbers all the way to the top. 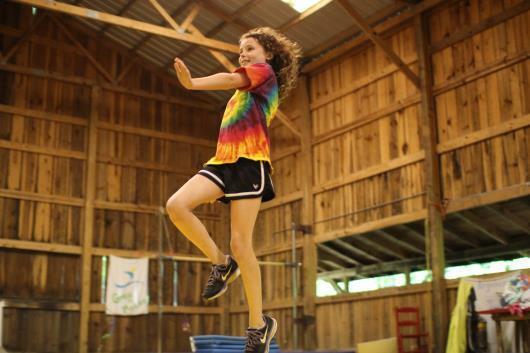 That heady sense of awe and disbelief when a camper achieves something she didn’t think she would be capable of is one of the greatest parts of the camp experience, and usually occurs in each girl at least once when she’s here. While we encourage accomplishments like these whenever we can, we also do our best to take away the push and pressure to achieve them. We let girls work at their own pace, for example, and allow them to drop activities that don’t interest them after just three days, rather than forcing them to continue, as might happen in a school. We help them to enjoy the process as much as the result, to gain more from the experience than from the prizes at the end. More importantly, we also try to strip away the urge to “get there first” that can be so prevalent in the outside world. That is, we take away that need to get to the top before anyone else, and to win at the expense of everyone else, that can so dampen the fun of any activity. A perfect demonstration of this came in our Miss RBC pageant Sunday afternoon. 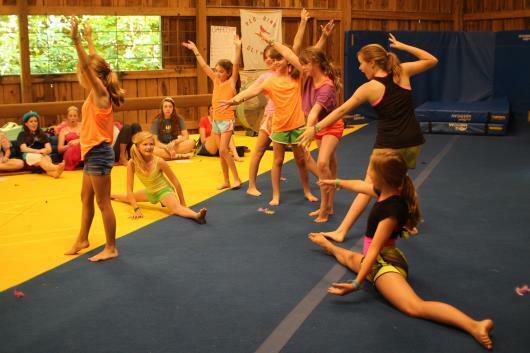 Each cabin spent last week crafting their very own cabin “talent” for the show, which could have been a dance, a song, a skit, or anything else they could think of. All last week, I saw cabins working during their free times, planning during meals, and scavenging costume bins around camp, all to create the perfect talent for Miss RBC. The most remarkable thing about the show, though, was the genuine enthusiasm with which each cabin cheered for all the others. Each cabin seemed thrilled simply to be able to put on their own talent for the rest of the camp, and derived just as much enjoyment from watching all the others’. 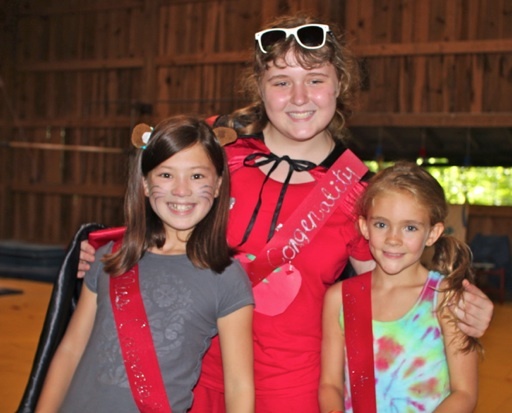 There was no uneasiness when campers saw a cabin that did particularly well, and no jealousy or resentment displayed toward the cabin that ultimately won the pageant. Indeed, that cabin found themselves surrounded by well-wishers as soon as the show was finished. The winning cabin was proud, of course, that they had won, but I heard more of them complimenting the other cabins on their talents than touting their own accomplishment. Camp, of course, is a unique environment, but I always hope that this is a lesson that our campers take with them into the outside world. That something should be created, a task achieved, or a goal accomplished, simply for the satisfaction of accomplishing it, rather than for the attendant recognition and glory. 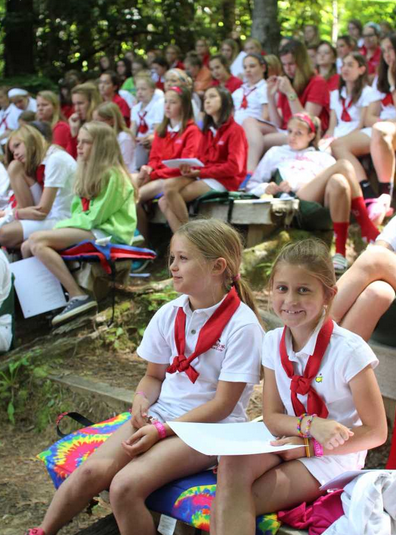 This Sunday, the girls of Rockbrook gathered in a peaceful little corner of camp for chapel, a non-religious service that gives our campers and counselors quiet time to reflect on the week, and discuss some of the most important values that we promote here at camp. 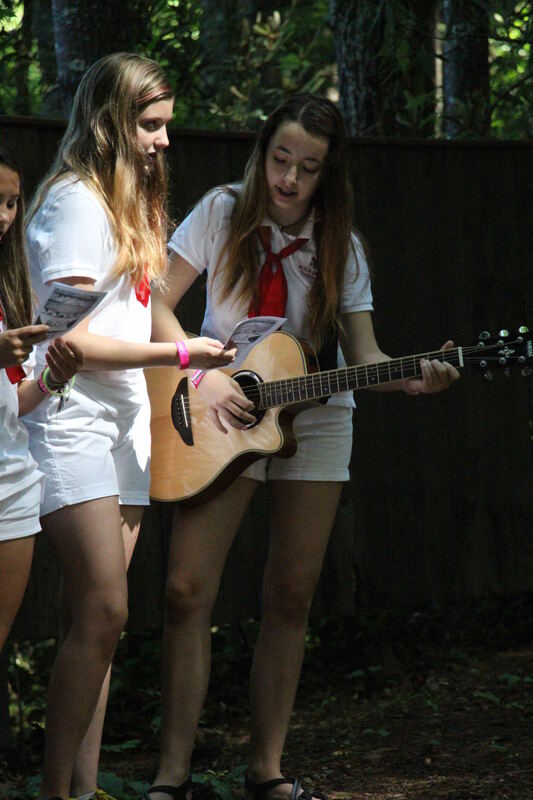 This week the theme of chapel was “Creativity,” so girls of the Junior and Middler lines stood before their peers to express the importance of creativity in camp life. There was talk of our crafts classes, of course—of the toothbrush-holders made in pottery, the baskets woven in Curosty, the bracelets beaded in jewelry making. There was mention of the play, of the dedication that it takes to create something special for everyone to enjoy. 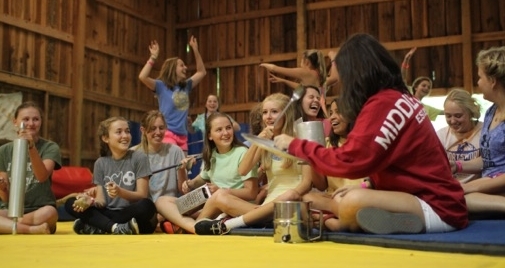 And several girls brought up the nightly creative endeavor, Evening Program, in which every cabin works together to put on a skit. 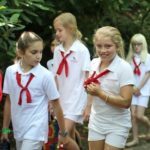 It was this last sort of creativity, in which the girls work together to create something new, that came to the forefront later that day in the Miss RBC pageant, after the crisp white uniforms of the morning had been replaced with the colorful—if slightly dirty—play clothes of the afternoon. Far removed from the beauty pageants you might see on TV, the Miss RBC pageant calls for one member of each cabin to dress up in the craziest, most over-the-top costume they can come up with and answer a silly question, such as “What’s your favorite jelly bean flavor, and why?” While it’s always fun to see the costumes that the pageant contestants and their cabin-mates put together (my particular favorite was the senior with toilet paper wrapped over her clothes, and her ponytail threaded through a plastic cup), the real highlight of the show is the talent portion. 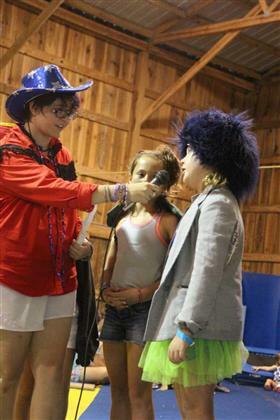 All week, each cabin worked together to plan a skit, dance, song, or puppet show to impress the judges. The ideas that they came up with were truly impressive. From juniors adapting a Rockbrook song into a moving (and hilarious) saga about a mermaid and a shark, to Middlers singing their own arrangement of songs a capella, to seniors choreographing elaborate dance routines, the show had it all, and proved to be immensely entertaining for everyone involved. 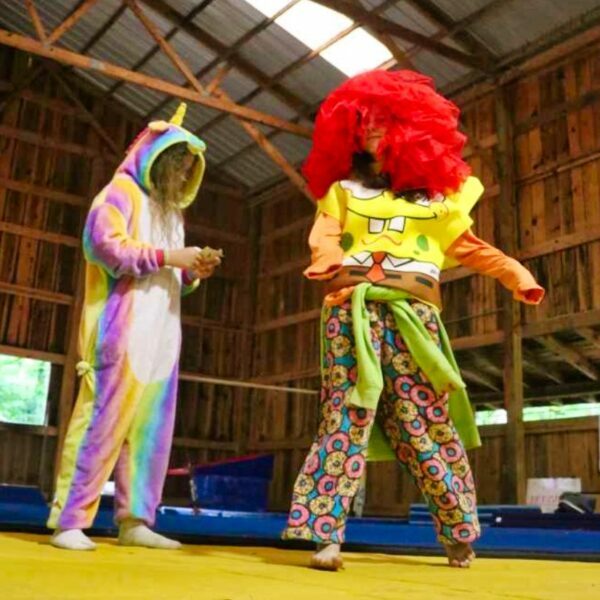 More exciting still were the looks of pride and accomplishment worn by the campers of each and every cabin as they trooped off stage after performing for the camp. Especially those campers who had been nervous to step onstage beforehand looked thrilled to have accomplished the feat, and to have done it all with their friends and cabin-mates standing right beside them. The girls stand in a horseshoe during the Flag Raising ceremony. Happy Sunday from Rockbrook! This is Chrissy here, the Waterfront Supervisor, bringing you the latest Rockbrook update! With third session winding down, the girls welcomed a relaxing Sunday at Rockbrook, starting with an extra hour of sleep. After our tasty Krispy Kreme breakfast treat, the girls headed to the hill for the Flag Raising. 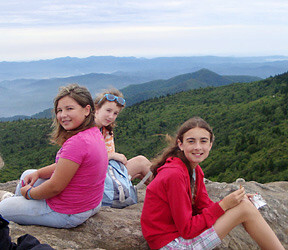 The red, white, and blue gleamed as the girls, dressed in their whities and red ties, raised the flag against a stunning backdrop of the Smoky Mountains. All of the girls dressed in their whities for Flag Raising and Chapel. 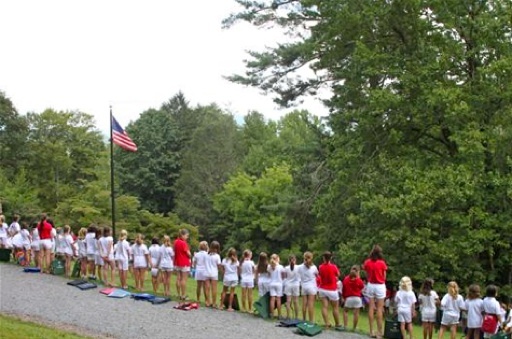 Next the campers walked the Path of Silence to Chapel, where the theme to ponder was gratitude. After a fitting story and a few traditional Rockbrook songs, the girls were invited to share objects or stories relating to the theme. 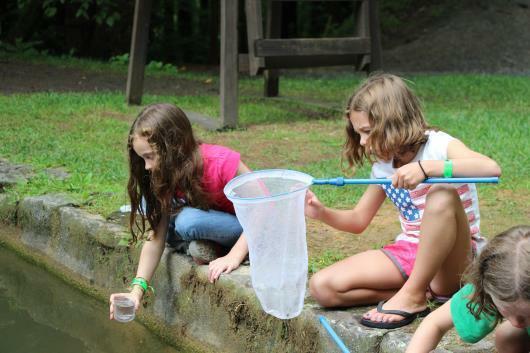 There was variety in the things the girls are most grateful for, ranging from dogs to family, but many campers voiced appreciation of their parents and of having Rockbrook as a haven in the wilderness. This afternoon culminated in the Miss RBC event, a mock “beauty” pageant where each cabin works together to showcase their combined talents. The girls performed skits, songs, and dances that required much cooperation and teamwork within each cabin. We were blown away by the performances that showcased their collective talents and cabin abilities. The final portion of the event was the question/answer routine for the Miss RBC representative from each cabin. 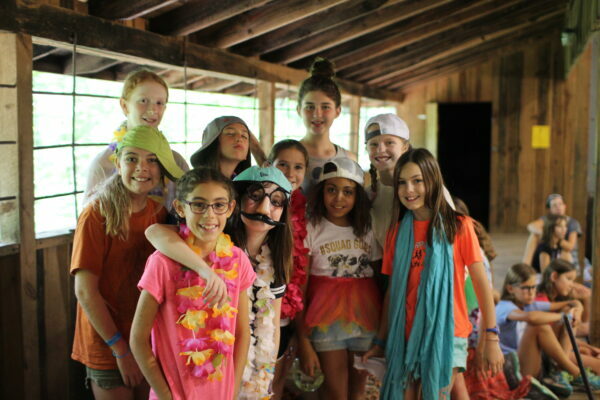 The questions included “Do you know the Muffin Man and what is his favorite muffin flavor?” and “What is a honosorarius?” The CITs acted as the guest judges, taking notes about the performances, costumes, and answers of the cabins and their representatives. At the end of the show, certain cabins were awarded ribbons. Each line had a Miss Congeniality cabin award, in addition to 1st Place, 2nd Place, and 3rd Place ribbons. Miss RBC is a great demonstration of teamwork and Rockbrook spirit. What a show!